MADRIX NEBULA is a standard Art-Net node. Because of this, you can use the device with applications, consoles, desks, or controllers that are compatible with Art-Net to distribute Art-Net data via Ethernet network. 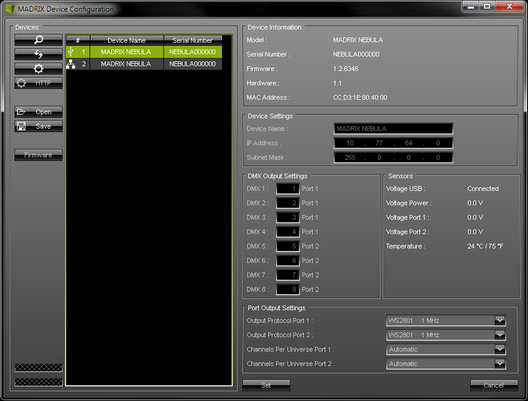 Please see the MADRIX NEBULA Quick Start Guide & Technical Manual on how to connect your LEDs to MADRIX NEBULA. Please see the MADRIX NEBULA Quick Start Guide & Technical Manual on how to connect to power and data. In order to put MADRIX NEBULA fully into operation, it is necessary to set the correct output protocol according to the LEDs you have connected. When connected to Ethernet computer network, you can easily configure MADRIX NEBULA using a web configuration interface. A] Open your web browser and enter the IP address of MADRIX NEBULA. ▪ Select your MADRIX NEBULA device in the list. This section shows specific settings for the output ports [Port 1 and Port 2]. Art-Net Universe - By default, Art-Net universes 1 - 4 are assigned to Port 1 and Art-Net universes 4 - 8 are assigned to Port 2. - If you are broadcasting data for a large number of Universes [using Broadcast Mode instead of using Direct IP Mode] with MADRIX or a 3rd-party controller for example, you can assign different DMX universes to each device with these settings. Each MADRIX NEBULA will then only receive data from the specific Art-Net universe and send it to its specified output port. - Example: You can set up that NEBULA #1 only listens to Art-Net universe 1 - 8, while NEBULA #2 listens to Art-Net universe 9 - 16, and NEBULA #3 listens to Art-Net universe 17 - 24, and so on. Output Protocol - In order to put MADRIX NEBULA fully into operation, it is necessary to set the correct output protocol according to the LEDs you have connected. You can set it up here. - Choose a signal frequency according to the specifications of your LEDs. - If you do not have this information, choose a signal frequency that works for your LEDs. If the refresh rate is set too high, you will usually notice that your LEDs flicker uncontrollably. If that is the case, choose a lower frequency. 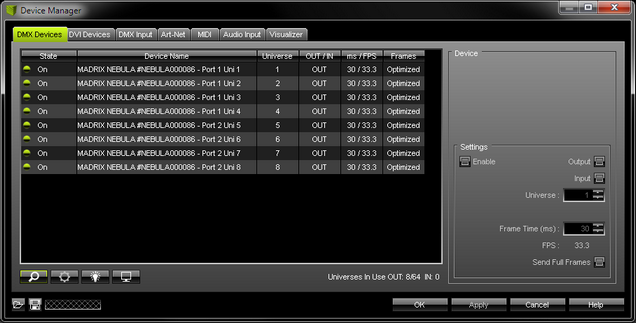 Channels Per Universe - Allows you to define how many DMX channels are sent per DMX universe for each port. This option enables you to adjust the device settings to the controller and LEDs you are using. - Automatic: The number of channels that is received is also sent out. This is the default value. This is also the recommended setting when using NEBULA in combination with the MADRIX software. - 1 - 512: Limits the number of output channels to this value. If your controller sends more channels than set up here, any channels that are higher than this value will be discarded. 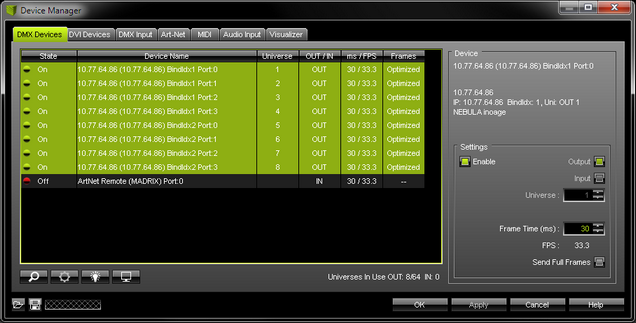 If your controller sends fewer channels, NEBULA will fill up the rest of the channels with values of 0 [Black]. - Using RGB LEDs: 170 RGB LEDs can be controlled with one single DMX universe. That means a maximum of 510 DMX channels is used. Depending on your controller [please see below], the recommended setting is Automatic or 510. - Using RGBW LEDs: 128 RGBW LEDs can be controlled with one single DMX universe. That means a maximum of 512 DMX channels is used. Depending on your controller [please see below], the recommended setting is Automatic or 512. - Using 1-channel LEDs: 512 single color LEDs can be controlled with one single DMX universe. That means a maximum of 512 DMX channels is used. Depending on your controller [please see below], the recommended setting is Automatic or the number of LEDs used. - Using MADRIX: By default, MADRIX sends optimized frames as set up in the Device Manager. That means according to the number of channels used by the fixtures and Patch, MADRIX and then NEBULA will send out the correct number of channels to the LEDs. - Using a 3rd-party controller: When your controller is only able to send full frames [which means that it always sends 512 DMX channels per single frame], it is recommended to set up a specific value here as described above in order to correctly work with MADRIX NEBULA and your LEDs. Recommendation: If using RGB LEDs, set up 510 channels per universe. Certain LEDs need to addressed first. Please check the below table to see if your LEDs might need to be addressed. ▪ If they are already addressed with another tool, you do not need to address them again. 1. Connect your LEDs as described above. 2. Connect to power and data as described above. 3. Choose the corresponding Addressing Protocol as Output Protocol of the MADRIX NEBULA. Confirm with 'Set'. You only have to do this once for your each LED tape. 4. Once your LEDs are addressed, continue by selecting the correct Output Protocol according to your LEDs. ▪ Choose the Addressing Protocol 'WS2822S Addressing' in order to address your LEDs. You can access all information and settings of the web configuration in MADRIX using the MADRIX Device Configuration window. ▪ Scans the USB ports of your computer and the network for connected MADRIX NEBULA devices. If devices are found, they will be shown in the list. ▪ Enables remote access to the web configuration as explained above. MADRIX NEBULA needs to be connected via Ethernet [network connection required]. First, connect your computer and the MADRIX NEBULA to one and the same network. Second, select your MADRIX NEBULA in the list. Third, click this button. A web browser opens automatically. 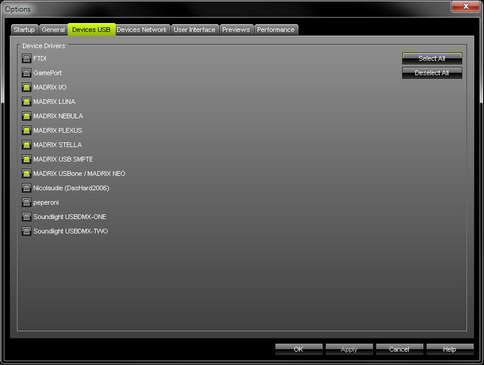 ▪ Imports the MADRIX NEBULA Device Settings from an external file [of the file type *.mndx]. Use this option to easily restore all device settings from a file [as described below]. ▪ Exports the MADRIX NEBULA Device Settings to an external file [of the file type *.mndx]. Use this option to easily store all device settings in a file. Simply enter a name in the window that opens and click 'Save'. ▪ Updates the firmware of your MADRIX NEBULA if a newer firmware is available [USB connection required]. You can connect the NEBULA over Ethernet network to the network card of your computer that runs the MADRIX software. Data is distributed to the device over network cabling [Ethernet] and sent to the output ports [Port 1 and Port 2]. ▪ Connect MADRIX NEBULA to your computer using Ethernet network cabling. ▪ It is highly recommended to use Gigabit Ethernet network components [network card, switches, etc.]. ▪ The IP addresses of your computer and your MADRIX NEBULA devices need to be different. [Via factory default settings, MADRIX NEBULA devices will have an IP address in the 10.x.x.x network range, such as 10.77.64.86, for example]. MADRIX can automatically add your MADRIX NEBULA devices. Each of your MADRIX NEBULA devices and its ports need to be activated. By default, they are still deactivated. ▪ Select your devices and their ports in the list. 8 output universes will be shown. ▪ By default, DMX universe 1 - 8 are assigned when using one MADRIX NEBULA. - When using only single-color or RGBW fixtures in the Patch, activating Send Full Frames is recommended if problems with the data output on your LEDs occur. 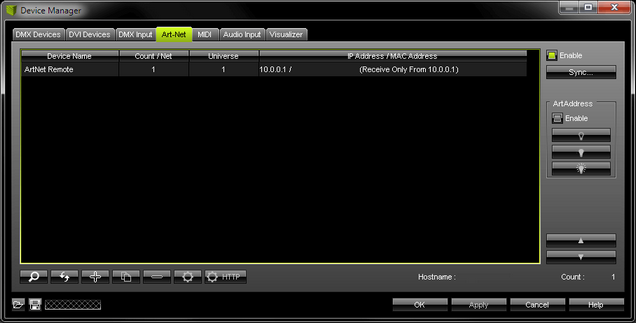 ▪ In addition, you can activate Full Frames for the device and each MADRIX NEBULA output universe separately. MADRIX NEBULA can use the special sync mode of MADRIX. ▪ Large LED projects require dependable data distribution. 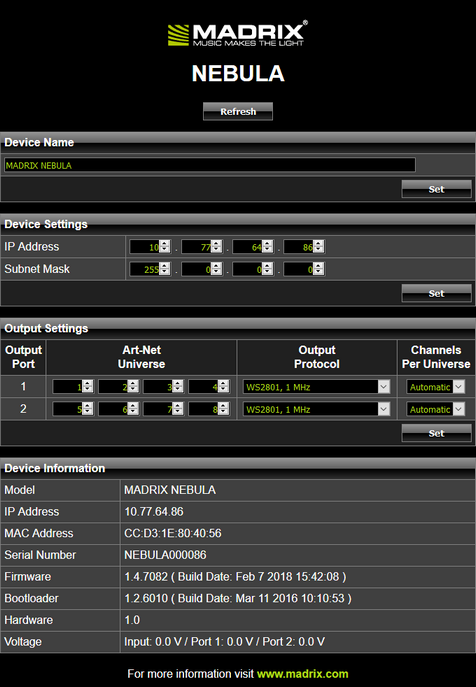 The MADRIX software and NEBULA hardware allow you to synchronize data output for all ports and even across multiple devices to get an optimal image on the LEDs. 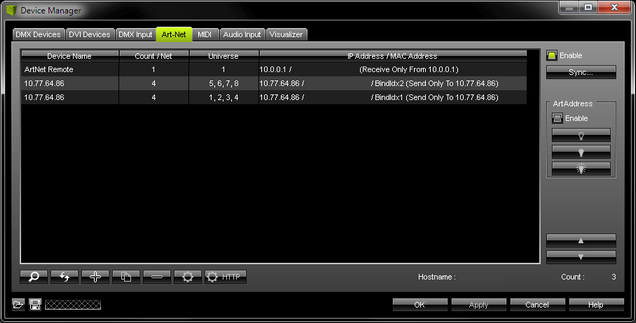 ▪ When MADRIX Sync mode is activated, MADRIX and MADRIX NEBULA will automatically handle the synchronization of data. MADRIX Sync Mode is highly recommended for MADRIX NEBULA! - Make sure to enter the correct IP Address of your device that should receive the Art-Net data. When MADRIX NEBULA has been automatically found by MADRIX, the IP address will be pre-configured for you. 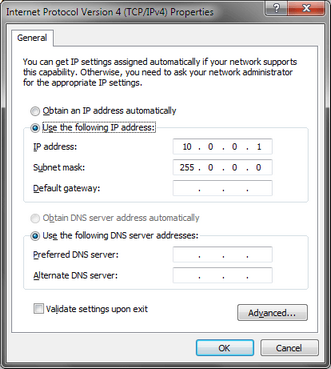 - Make sure to select the correct Network card of your computer that should send the Art-Net data. When MADRIX NEBULA has been automatically found by MADRIX, the correct network will be pre-configured for you. ▪ MADRIX NEBULA features automatic HTP merging from 2 Art-Net sources. ▪ Data from both source will be merged together and sent out as 1 signal. This happens across all output ports and by using the HTP principle. 4] Always use Direct IP Mode to directly send data to the correct IP addresses of your MADRIX NEBULA devices. You can connect the NEBULA directly via USB to the computer that runs the MADRIX software. Data is distributed to the MADRIX NEBULA over USB and sent to the two output ports [Port 1 and Port 2]. ▪ Connect MADRIX NEBULA to your computer via USB. ▪ Your NEBULA devices and all of their output universes will appear in the list. - When only using single-color or RGBW fixtures in the Patch, activating Send Full Frames is recommended if problems with the data output on your LEDs occur. The following tables describe the LED status codes of the device. Power not connected. ’ The device has no power. Connected to power. ’ The power is on. Bootloader activated. ’ Reset the device to factory default settings. ’ Sending or receiving data over USB. The USB port works. Connected to USB; Drivers installed correctly. ’ No data is sent over USB. ’ Reinstall software and drivers or try a different USB port. Sending data to Port 1. ’ The output port works. Sending data to Port 2. Sending or receiving data. ’ The Ethernet port works. 1] Disconnect all connections from the device [power, data, LEDs]. 2] Use a suitable tool to press the reset button [between Port 1 and Port 2]. 3] Continue to press the reset button and supply power again over 'Power' or USB. 4] Continue to press the reset button and wait until all status LEDs of the device flash repeatedly or wait 10 seconds. It is highly recommended to update the firmware of the device should a new firmware version become available. You can do so in different ways. 1] Connect MADRIX NEBULA to your computer over USB. 2] Start the MADRIX software. 4] Click to search for connected devices and your device will appear in the list. 6] Wait for the process to end [usually it takes only seconds]. 7] Disconnect MADRIX NEBULA from USB and power. Afterwards, connect it again. ▪ Connect MADRIX NEBULA to power. ▪ Connect MADRIX NEBULA to your computer over Ethernet network. ▪ Added new supported LEDs: P9883. ▪ Added new supported LEDs: SK6812. ▪ Added new supported LEDs: SK6822. ▪ Web configuration tool: Added Voltage to the Device Information section. ▪ Web configuration tool: Added the Refresh button to always show the latest information that was last saved on the device in the web browser [instead of using a browser refresh which may change settings again]. ▪ Web configuration tool: Streamlined spelling of output protocols. ▪ Added new supported LEDs: GW6201. ▪ Added new supported LEDs: TM1814. ▪ Added new supported LEDs: WS2813. ▪ Added new supported LEDs: WS2818. ▪ Changed name of supported LEDs: From TLS3001 To TLS3001 Linear. ▪ Added supported LEDs: TLS3001 Quadratic [For 12-bit LEDs]. ▪ Output settings: Added the option to define the number of channels sent per universe for each port [Channels Per Universe]. ▪ Sensor data: Devices can now report back if voltage is connected/disconnected over USB [Voltage USB]. ▪ Sensor data: Devices can now report back which voltage is used for Power, Port 1, and Port 2 [Voltage Power, Voltage Port 1, Voltage Port 2]. ▪ Sensor data: For NEBULA models V1.1 and higher, devices can now report back the ambient temperature [Temperature]. ▪ Fixed an issue that could make the device become unresponsive under certain circumstances when connecting, disconnecting, and calling up the website several times in a row. ▪ Fixed an issue that could produce display issues with the built-in web configuration tool when confirming changes via 'Set'. ▪ Added new supported LEDs: MBI6120. ▪ Added new supported LEDs: WS2822S. ▪ Added new supported LEDs: WS2822S Addressing [To linearly address LEDs that haven't been initialized yet]. ▪ Added new supported LEDs: UCS512B3. ▪ Added new supported LEDs: WS2811S. ▪ Added supported LEDs: MBI6120, Limit 33 % [To limit the output to 33 % of the possible maximum]. ▪ Added supported LEDs: MBI6120, Limit 66 %. [To limit the output to 66 % of the possible maximum]. ▪ Fixed an issue that could leave the status LEDs permanently on when using the ArtAddress functionality for Art-Net to switch from normal operation to off while the status LEDs were currently active. ▪ Fixed an issue that did not allow to select every 40th number of the Channels Per Universe setting. ▪ Added new supported LEDs: GW6205. ▪ Added new supported LEDs: SJ1221. ▪ Added new supported LEDs: LPD1882S. ▪ Added new supported LEDs: WS2815. ▪ Fixed an important issue that allowed the device to only send with the lowest, received frame rate, when receiving different frame rates for different DMX universes on a single port. This behaviour was mainly triggered when used with a lighting console. ▪ Fixed an issue that correctly set Channels Per Universe in the web configuration but still displayed the value as 'Automatic'. ▪ Fixed an issue that did not set Channels Per Universe for Port 2 if USB as well as Ethernet were connected and the settings was changed for both ports in the MADRIX Device Configuration. ▪ Added new supported LEDs: UCS9812S. ▪ Fixed a connection issue that did not report the device settings and status correctly in the MADRIX Device Configuration dialog when only connecting over Ethernet network. ▪ In general, it is recommended to always activate all output universes. SPI communication is based on strictly serial protocols, which means that data is always sent in succession. For example, when having output universe 1 and 4 activated and having output universe 2 and 3 deactivated, the data for output universe 4 will be sent directly after the data for output universe 1. This section contains technical information that point out specific advice for certain LED types. ▪ LEDs of the type WS2815 normally require 12 V to work. 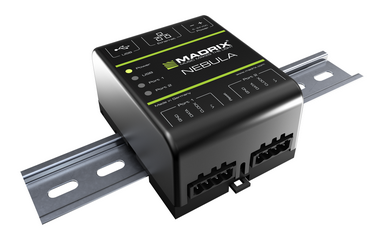 ▪ MADRIX NEBULA offers a variety of wiring possibilities as shown in the MADRIX NEBULA Quick Start Guide & Technical Manual. ▪ Due to this variety of options, WS2815 might start to flicker when the data signal from the NEBULA unit to the LEDs does not provide enough voltage in certain ways of wiring. ▪ The issue described above usually only becomes apparent when 12 V power is supplied to the WS2815 LEDs as well as 5 V separately to NEBULA via an external power supply, such as USB or USB power supply. Then, the data signal from the NEBULA might fall below the required voltage to control the LEDs due to the power loss from power input to data output. ▪ If power is supplied separately, to NEBULA at 5 V and to WS2815 at 12 V, then it is recommended to supply power of more than 5 V to the NEBULA (> 5 V) in order to counteract the power loss and avoid data signal issues, which can result in flickering on the LEDs.